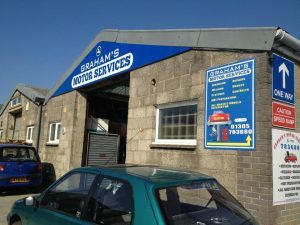 Welcome to Graham’s Motor Services, your local independent garage employing 1st rate experienced motor car mechanics. We are based in Weymouth, Dorset on the Granby Industrial Estate. Our garage has been established since 1986, has over 25 years of repairing vehicles in the industry. You can trust us to fix your car, van or motorhome at an affordable price at a local garage. Whether it’s from MOT preparation, a clutch replacement, renewing a cambelt or servicing your vehicle, to brake pad and disc replacement and general auto repairs, we are happy to help. Graham’s Motor Services will maintain your vehicle with utmost care and attention and get it back on the road. Please see our list of motor vehicle repairs that we carry out, at below average costs of main dealers. Any mechanical service you cannot see on our website that you might require, please contact us on 01305 783680 and speak to one of our experienced motor technicians. We offer a collect and return service. So you don’t have to worry about how you will get to and from our mechanical workshop. We can repair or use electronic diagnostics on anything from car, light commercial vehicles or even small motorhomes.